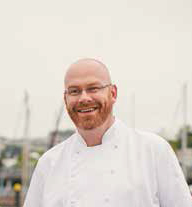 Simon Hulstone, chef proprietor at The Elephant, in Torquay, is an award-winning chef with a talent for using local, seasonal produce to create memorable flavours. Since the age of 16, Simon has been competing (and winning) competitions around the world. Simon has represented his country on more than 20 occasions, twice in the world’s most prestigious culinary contest, the Bocuse d’Or. Simon has worked with some of Britain’s most respected chefs including his father Roger who was executive chef at the luxury Imperial Hotel in Torquay; Simon worked alongside his father in the kitchen from the age of 14. His chef mentors and experience in top competitions have given Simon a passion for great ingredients and a finesse for taste and presentation which continues to win praise from critics and customers alike. The Elephant restaurant and bar has held three AA rosettes since 2005. In 2006, Simon and his team won Torquay its first Michelin star, which The Elephant maintains today. Simon acknowledges the huge benefits of winning the Roux Scholarship which gave him the chance to work with Martín Berasategui at his eponymous restaurant in Spain which has an outstanding three Michelin stars. He is passionate about nurturing young talent and works with catering colleges offering work experience, training chefs to Michelin standards and mentoring them to compete in national and international competitions. 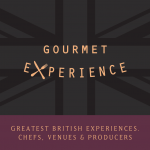 Outside of the restaurant, his highlights include working with Heston Blumenthal to create a menu for British Airways passengers during the Olympics and Paralympics and preparing a Team GB fundraising banquet which was attended by Prince William and the Duchess of Cambridge. The Elephant is run by Simon and his wife Katy, and is a bright, informal restaurant overlooking Torbay harbour. Taking the commitment to local produce seriously, The Elephant has its own dedicated 69-acre farm in South Devon. The farm rears free-range pigs, sheep, hens and turkeys and cultivates seasonal fruit, vegetables, herbs and flowers. Ground-floor brasserie with more formal room above serving creative dishes with a local flavour. Place the flour for the tortellini into a food processor, pulse and add three of the eggs and the yolk, one by one. Stop processing as soon as the mixture comes together. You may not need all of the eggs; if you add too much, thicken with a little flour. Tip the mix out on to a floured surface and knead for three to five minutes or until smooth. Divide in half, wrap in cling film and leave to chill in the refrigerator. For the filling, place the prawns into a bowl with the breadcrumbs. Add the double cream and mix until combined. Season the filling with salt and lemon juice to taste. Cut eight circles of pasta using a 7cm pastry cutter. Lightly beat the remaining egg and brush the egg to coat the edges of the pasta circle so that the tortellini will seal. Place a ball of filling into the centre of each disc. Enclose by folding each disc of pasta in half to form a semi-circle using your thumb and forefinger to force out any air and seal the edges. Press the straight-line side of the tortellini on a flat edge to form a base, this will ensure the pasta stands upright when served. Brush the pasta with melted butter and place on to a tray lined with baking parchment. Set aside in the refrigerator to chill. Place a large saucepan over a medium heat for the fennel purée. Add the butter and fennel to the pan and sweat for five minutes. Add the milk and cream and bring to the boil. Reduce to a gentle simmer and cook for 10-15 minutes until the fennel is soft. Remove from the heat and strain off the liquid; reserve. Place the fennel into a blender with enough cooking liquid to cover the fennel and blend until smooth. Pass through a sieve, adding more liquid to ensure the finished purée is smooth but holds firm, and set aside until needed. Trim the roots from the baby leeks, but make sure you keep the base of the leek intact. Cut 3cm off the top of each leek and cut in half. Add a large handful of salt to a pan of boiling water and drop in the baby leeks for 30-45 seconds. Remove the water and plunge in a bowl of iced water for five minutes. Drain and place on absorbent kitchen towel. For the white wine sauce, place the whole shallot, vinegar and white wine in a medium saucepan. Bring to the boil, turn down to a simmer and reduce to approximately 30ml. Remove the shallot and reduce the heat to the lowest setting. Slowly add in the butter whilst whisking vigorously. When most of the butter has been added, remove the pan from the heat and whisk in the last of the butter to achieve the desired consistency: the sauce should coat the back of a spoon. Season to taste with salt and keep warm. For the wild mushrooms, heat the butter in a small pan over a medium to high heat. Once the butter begins to foam, add the mushrooms and cook for five minutes. Season to taste with salt and keep warm. For the sea bass, place a large non-stick pan over a medium to high heat and pour in enough rapeseed oil to cover the base. Once the oil is hot, place the fillets skin-side down into the pan. Press down the flesh of the fish lightly with a spatula to ensure it cooks evenly. After two to three minutes, turn the sea bass over and add a knob of butter and the blanched leeks to the pan. Remove the pan from the heat and transfer to a preheated oven at 200°C for three minutes. Remove from the oven, season with salt and allow the fish to rest whilst plating the dish. Drop the tortellini into a pan of boiling water and cook for two to three minutes or until the pasta is tender but not soggy. Remove the tortellini from the water and toss through a little olive oil. 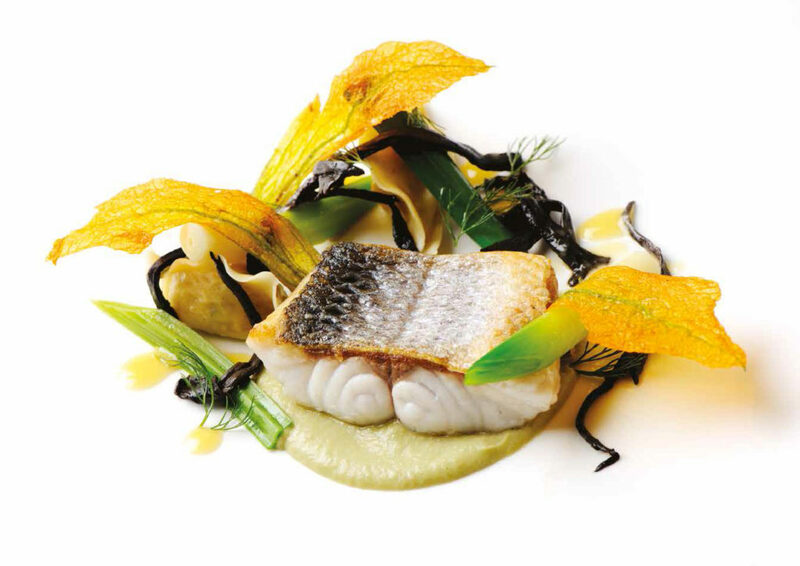 To serve, divide the warm fennel purée across four plates and place the sea bass fillets on top. Add the tortellini beside the fish along with the warm leeks, mushrooms and courgette flower. Drizzle with the white wine sauce and serve immediately.